If you are familiar with the most iconic tent of this brand, you might want to read this Sierra Designs Clip Flashlight 2 Review, the famous tent has been fully redesigned in 2017. See more below. Sierra Designs Clip Flashlight 3-Season Tent shown here without the fly. From the video below you will see that this iconic tent has been around from 1982. It has been redesigned in 2017 and the biggest change is in the door and vestibule design. Of course, the color is different. Have you noticed that all Sierra Designs 2017 models are in blue, just like the tent presented here? So, iconic or not, this tent is non-freestanding. This means you have to stake it to the ground in order to set it up. This may not look important to you, but if you find yourself in an area with rock, gravel, or a frozen ground, you will be in trouble. I was with my own non-freestanding tent, so I know from my own bad experience. If you want something freestanding from the same brand, check this new Meteor 2 Tent. The tent is the 3-season type, so you have a double-layer construction with an inner tent and a fly. Only two poles are here, so this is not designed for very harsh conditions with a lot of wind or snow. For such a use, you will have to check some of winter tents, but those tools are far more expensive, just to know. Non-freestanding tent with a full coverage fly. With the weight of “only” 3 lb 14 oz (1.76 kg), this tent is light enough even for backpacking adventures if the weight is shared between the two users. 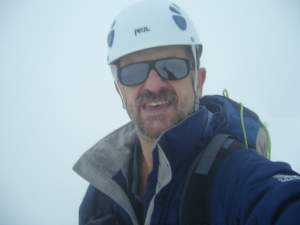 It is great for overnight or weekend hiking and mountaineering tours, and certainly also for the car or motorbike camping. The tent is designed for two people, so you have just enough space for such a purpose. But this may work only if you are very intimate with the other user. The space is narrow indeed; at the feet area it is only 45 inches (114 cm) so only the narrowest two sleeping pads can fit there. You might consider a double sleeping pad like Klymit Double V but you will notice it is 119 cm wide. The Clip Flashlight 2 Tent – a great tool for couples. You will be close to each other for sure. If you do not carry it in the backpack, this is a perfect tent for solo use, in particular if combined with some of those very low cots that are around 15 cm of height. Note that the tent length is 89 inches (226 cm), so any of the cots on the market will fit inside. You can see some great options here. Note that you can still store some items under such a cot. 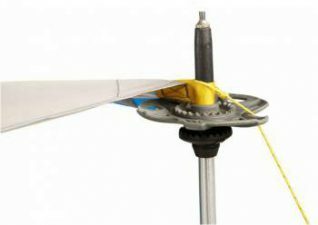 The setup is typical for this non-freestanding type, so you will stake out the base of the tent with 4 stakes (provided) and follow the usual steps. This means adding the poles and the fly, staking out the fly, etc. The inner tent connects to the poles through the clips; you have seen the word clip in the name. In fact, this clip design has started with this tent long ago in 1982. The remaining stakes you will use for the fly and the vestibule. The inner tent is only mesh, except for the bathtub floor. So the ventilation should be optimal, in particular with its star-gazing setup, see more below. The door is on the front, so this is the best option in the case of a single door design as both users will be in an equal position to use it. 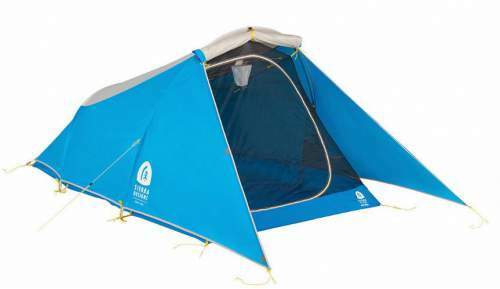 You might want to compare this with the Big Agnes C Bar 2 Backpacking Tent which is with the same design. Inside, you have mesh pockets on the wall, for both users. The tent comes with the bonus Night Glow lantern which gives a soft and pleasant light when you put your headlamp in it. It is visible in the pictures. The original version of this tent became famous for its clip system. The pole used for the awning setup. The tent is with a single vestibule, so you have 8.8 ft² (0.82 m²) of the covered space. This is not much for a tent for two people, and I am not impressed. Note also that whatever you store there, it will be on your way when you try to get in or out of the tent. But the vestibule is indeed very versatile, so this compensates for its small covered area, and I would say this is the best part of the tent. 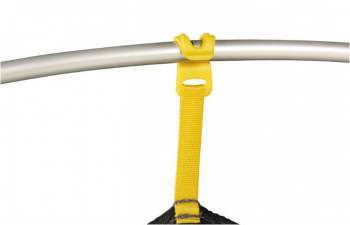 It is with two zippers and this is what allows for several configurations, including an awning setup with the help of trekking poles, see the picture. So this is something really cool, and you will need it for such a small, low, and narrow tent. See the pictures to realize how great this is. Awning setup with the help of poles – a pleasant place for sitting in the shade. You can also roll the roof of the vestibule up, and keep the side wings deployed as usual, see the picture below. So this is a bit of a star-gazing option with an excellent ventilation, and the wings serve as windbreakers. The vestibule roof rolled up. Observe the lantern. This tent is fully waterproof, and all seams are taped, so this is definitely a reliable tool. The fly is with 1500 mm rating, and the floor is 3000 mm rating, and with PU coating. This is better than in some winter tents. The design is bathtub type, so you are pretty much safe from groundwater. The materials are quite durable, so you have the fly with 68D 190T Poly Taffeta, while the floor is 70D Nylon Tafetta. Therefore it is not surprising that the tent is not in the category of those super-lightweight backpacking tents. The poles are aluminum DAC press fit, with 8.7 mm diameter, quite decent for this size and the type. The DAC is a brand of aluminum poles by Dongah Aluminum Corporation, hence the abbreviation DAC. In the specifications they give CPAI84. If you are not familiar, this is a standard for the flammability of recreational tents, set by the Industrial Fabrics Association International (IFAI). The letters CPAI stands for Canvas Products Association International, which used to be the name of IFAI. So they write FR CPAI84, where the letters FR stand for Fire Retardant. 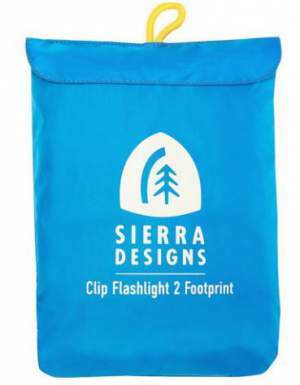 Sierra Designs Clip Flashlight 2 footprint. My main issue with this tent is its non-freestanding design. But this may not be essential for you, and if so, just disregard it. At the moment of writing this text, the Amazon price for this tent is $200 (but this may be different when you read this text, see the link). So this may look a bit steep, but this is very reasonable when you compare it with other tents of this type and weight. After all, this is a reliable brand. Note also that its smaller cousin, the Light Year 1 is only $115. Minimum weight: 3 lb 6 oz (1.53 kg). Packaged weight: 3 lb 14 oz (1.76 kg). Packed size (L x D): 18 x 6 in (46 x 15 cm). Interior area: 30 ft² (2.79 m²). Gear storage area: 8.8 ft² (0.82 m²). – Width: front 52 in (132 cm); rear 45 in (114 cm). – Length: 89 in (226 cm). – Internal peak height: 42 in (107 cm). Poles: 2, DAC press fit, 8.7 mm. Pole set weight: 10.65 oz (302 g). Fly: 68D 190T Poly Taffeta 1500 mm PU WR FR CPAI84. Floor: 70D Nylon Taffeta, WR/PU 3000 mm, FR CPAI84. Body fabric: 15D nylon No-See-Um mesh. Reflective guylines and guy-out loops. Fully taped seams (PVC free). This tent is in between the backpacking and ordinary camping tents. You can realize this by comparing it with some of them. So below I give the lightest tent on the market, the Big Agnes Fly Creek tent, and one of Kelty’s tents, see how they compare. To see more please follow the links. You can read more also in my page with the long list of lightweight tents for 2 people. As you realize, the Clip Flashlight 2 Tent is pretty much in the middle by its main parameters. But see also the prices at the moment of writing the text. They are, respectively, $200, 200, and 550. So you get some idea, this is a great tent and the price is more than reasonable. In the conclusion of this Sierra Designs Clip Flashlight 2 Review I would say this is indeed an improved version of the classic tent. The price is very reasonable, the quality is there, the brand is very reliable. This is why I can fully recommend this tent. If you need a true solo tent from this series, check the Light Year 1 tent. Need more comfort from the same brand? 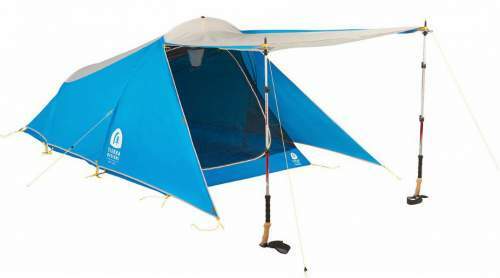 Check this Sierra Designs Divine Light 2 FL tent. You might want to check this Big Agnes Copper Hotel HV UL2 with a huge porch and a vestibule. Otherwise, visit my page about tents and shelters, many of them are available there, you will find something for you. Thank you for reading. In the case of questions or comments, please use the comment box below. I wish you a nice day.